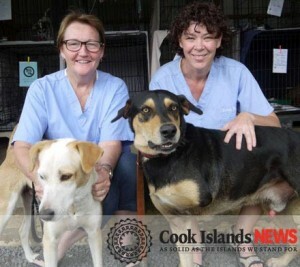 The Esther Honey Foundation thanks Australian vets Cathy O’Neil and Tracey Kloos from Macquarie Road Vetz who not only volunteered their considerable skills at the Esther Honey Foundation Clinic but also solicited donations of more than $15,500 in veterinary supplies including contributions from Genvet and Saxon vet suppliers to bring with them! Tracey and Cathy have over 45 years of veterinary experience between them which has been especially helpful with the recent increased demand for Esther Honey’s free de-sexing services. The spike in scheduled surgeries could be a great sign that almost 18 years of EHF education programs lauding the benefits of de-sexing have had an impact. But an even more likely source of inspiration is the recent police crack-down on dog registrations. Either way, the more spay/neuters the better! Meitaki Maata Cathy and Tracey!